Kairouan (Arabic القيروان) (also known as Kirwan, and Al Qayrawan) is the capital of the Kairouan Governorate in the nation of Tunisia, about 160 kilometers (100 mi) south of the capital city of Tunis. Kairouan was founded in 670 C.E., when the Arab Umayyad general Uqba ibn Nafi selected the location as a base for military operations. 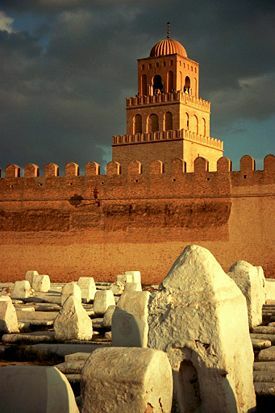 The Mosque of Uqba, also known as the Great Mosque of Kairouan, was built when the city was founded. The mosque covers a surface area of 9,000 square meters (97,000 sq ft). It served as a model for all later mosques in the Maghreb of the western Islamic world. 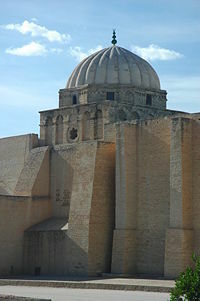 Under the Aghlabids, the fame of the Mosque of Uqba and of the other holy sites at Kairouan aided the city's development. By the ninth century C.E. the city had become a center of Islamic thought, due both to its mosque and the university, which was a center of education both in Islamic thought and in the secular sciences. Despite the transfer of the political capital to Tunis in the twelfth century, Kairouan remained the Maghreb's principal holy city. Declared a UNESCO World Heritage Site in 1988, tourism, the establishment of a university there in 2004, and the establishment of light industry, helped revive the city's economy. In 2003 the city had 150,000 inhabitants. The original name of the city was derived from the Arabic word kairuwân, meaning "camp," "caravan," or "resting place." Kairouan is located on the Low Steppes area of Tunisia, a semi-arid alluvial plain southeast of the Central Tell, about 100 miles (160km) south of Tunis, at an elevation of 223 feet (68 meters). Kairouan has a semi-arid Mediterranean climate, with hot summers and mild winters, when there is more rainfall. Spring and autumn are pleasant. The average maximum daytime temperature in January is 63.5°F (17.5°C), rising to an average maximum of around 99.5°F (37.5°C) in July. Mean annual precipitation is 12.1 inches (309mm). Environmental issues include health risks posed by ineffective toxic and hazardous waste disposal, water pollution from raw sewage, and limited natural fresh water. To protect Kairouan city against flooding from Wadi Merguellil, the El Haouareb dam was constructed in 1989. This tiered minaret is a remnant of a golden age. Mosque on Kairouan's main street, 1895. Evidence of human habitation in North African regions stretches back one or two million years. Berbers (anciently more often known as Libyans occupied the region since about 8000 years ago). Phoenicians settled the coast around 1000 B.C.E., and the city of Carthage, near present-day Tunis, was founded in the ninth century B.C.E. by settlers from Tyre. Berbers captured Kairouan in 688, and again in 745, by which time it was a developed city with luxuriant gardens and olive groves. Power struggles continued until Ibrahim ibn al-Aghlab (756-812) recaptured Kairouan at the end of the eighth century. In 800, Ibrahim was confirmed Emir and hereditary ruler of Ifriqiya, by the Caliph in Baghdad. Aghlab's dynasty ruled Ifriqiya between 800 and 909. Kairouan prospered, with wealth comparable to that of Basra and Kufa, giving Tunisia one of its golden ages. Aghlabite Emir Ziyadat Allah I rebuilt the great mosque in 836, and Emir Abou Ibrahim Ahmed added to it in 862-863. Within the mosque was a university that became a center of Islamic thought and secular sciences, attracting scholars from all over the Islamic World, including Imam Sahnun (776–854), and Asad ibn al-Furat (759-828). The Aghlabites built palaces, fortifications, and fine waterworks, and conquered Sicily in 827. The Aghlabid emirs enjoyed personal and political excesses, made possible by the lucrative slave trade, prompting the emergence of the Maliki school, which is one of the four schools of Fiqh (religious law or jurisprudence) within Sunni Islam. In 893, Kutama Berbers from the west of the country started the Shiite Fatimid movement. Fatimid Obaid Allah in 909 overthrew the Sunni Aghlabites, creating the Shiite Fatimid dynasty. Kairouan was neglected as Obaid Allah, who ruled from 910-934, resided first in Raqqada but soon moved his capital to Al Mahdiyah, founded in 916, on the coast of modern Tunisia. The Fatimids extended their rule over all of central Maghreb, an area including modern Morocco, Algeria, Tunisia and Libya, and moved west to Egypt to found Cairo, making it the capital of their vast Califate, and leaving the Zirids, a Kutama Berber dynasty, as their vassals in Ifriqiya. Governing again from Kairouan, the governing Fatimids, the Berber Zirid dynasty, led the country through another artistic, commercial and agricultural heyday. Schools and universities flourished, overseas trade in local manufactures and farm produce ran high, and Zirid courts were centers of refinement eclipsing those of their European contemporaries. In 947-948, the third caliph, Al-Mansour, founded the new city of Sabra Al-Monsouria 1.5km south of Kairouan. However, the Fatimid caliphate transferred to Cairo in 972. But the Zirids converted to Sunni Islam in 1045, declared their independence from Cairo, and gave their allegiance to Baghdad. The Fatimid Caliph Ma'ad al-Mustansir Billah (1029–1094) sent hordes of Arab tribes (Banu Hilal and Banu Sulaym) to invade Ifriqiya. In 1057, Kairouan was invaded and sacked. 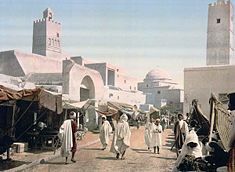 Kairouan declined into an isolated market town for nomads, although it retained its status as the holy city of the Maghreb. In 1159, Tunisia was conquered by the Almohads, caliphs of Morocco (1130–1269), who sought to purify Islamic doctrines. From 1160, Tunis became the capital. The Almohad Dynasty was succeeded by the Hafsids Dynasty (c.1230–1574), under whom Tunisia prospered. In the last years of the Hafsids, Spain seized many of the coastal cities, but these were recovered for Islam by the Ottoman Empire. The Ottoman Empire was comprised mostly of Turks with governors or Beys, under whom Tunisia attained virtual independence. In the late sixteenth century, the coast became a pirate stronghold. The piracy carried on thereafter by the Muslims of North Africa began as part of the wars against Spain. In the seventeenth and eighteenth centuries, when the Turkish hold on the area grew weaker, the plunder, ransom, and slaves that resulted from attacks on Mediterranean towns and shipping and from occasional forays into the Atlantic became the main source of revenue for local Muslim rulers. In the spring of 1881, France invaded Tunisia, claiming that Tunisian troops had crossed the border to Algeria, France's main colony in Northern Africa. The French, controlled Kairouan until 1956, having established a protectorate system of administration that recognized the nominal authority of local government. Violent resistance to French rule boiled up in 1954. Independence from France was achieved on March 20, 1956, as a constitutional monarchy with the Bey of Tunis, Muhammad VIII al-Amin Bey, taking the title King of Tunisia. 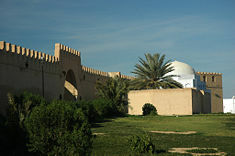 Panorama of the minaret and the courtyard (on the right) of the Great Mosque of Kairouan. Tunisia is a republic in which the president, who is chief of state, is elected by popular vote for a five-year term, and has no term limits. The prime minister, who is head of government, is appointed by the president. There is Chamber of Deputies, or Majlis al-Nuwaab, comprising 189 members elected by popular vote to serve five-year terms, and the Chamber of Advisors, comprising 126 seats of which 85 members are elected by municipal counselors, deputies, mayors, professional associations and trade unions, and 41 members are presidential appointees. Kairouan is the capital of the Kairouan Governorate, which is one of Tunisia's 24 governorates, and which are divided into 262 districts (mutamadiyat), and further subdivided into delegations. There are 11 delegations in Kairouan, which are further divided into municipalities. Tourism has made an impact on Kairouan since it was declared a World Heritage Site in 1988, most notably by providing a reason for the conservation of the old city and the development of the town’s Musée d’Art Islamique. According to statistics released in December 2008, Tunisia hosted, during the first 11 months of 2008, around 6.6 million tourists, an increase of 3.7 percent on the previous year. The establishment of a university in 2004, and of some light industry meant the town has expanded quickly. Otherwise, the modern city trades in grain and livestock from the surrounding region, and exists as a center for carpet and handicrafts. A road and railway link Kairouan with Sousse, 38 miles (61km) to the east. 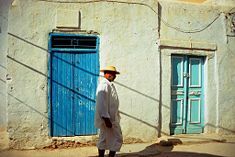 Kairouan had about 150,000 inhabitants in 2003. Ninety eight percent of Tunisia's population were Arab, one percent were European, while Jewish and others totaled one percent. Arabic is the official language, and one of the languages of commerce, while French is used in commerce. Muslims make up 98 percent of the population, Christians one percent, Jewish and other one percent. 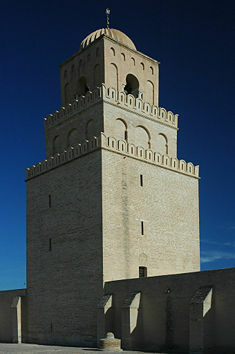 There are numerous mosques in Kairouan, including the great mosque. Judaism featured in Kairouan's history, particularly in the early Middle Ages. Rabbeinu Chananel (990-1053), who is best known for his commentary on the Talmud, was from Kairouan. Kairouan University had more than 3000 students enrolled in 2008. A dome of the Great Mosque. Also known as the Great Mosque of Kairouan, the Mosque of Uqba is regarded as a significant monument to Islam, as well as a masterpiece of both architecture and Islamic art. 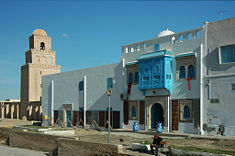 Under the Aghlabids, the fame of the Mosque of Uqba and of the other holy sites at Kairouan helped the city to develop and repopulate little by little. The university, consisting of scholars who met in the mosque, was a center of education both in Islamic thought and in the secular sciences. Its role can be compared to that of the University of Paris in the Middle Ages. With the decline of the city, the center of intellectual thought moved to the University of Ez-Zitouna in Tunis. Built by Uqba ibn Nafi beginning in 670 C.E. (the year 50 according to the Islamic calendar) at the founding of the city of Kairouan, the mosque is spread over a surface area of 9,000 square meters and is considered as a model for all later mosques in the Maghreb in the western Islamic world. One of the most important mosques in Tunisia, it is certainly one of the most extensive monuments in North Africa with a huge perimeter approximately equal to 415 meters (1,361 feet). This enormous space contains a prayer hall, a large marble-paved courtyard and a massive minaret. There are 414 columns in the mosque, nearly all of which were taken from the ruins of Carthage. The mosque's current structure dates from 863 C.E. For centuries, it has served as a pilgrimage destination for North Africans for whom the trip to Mecca was an impossibility. According to popular belief, seven trips to Kairouan was worth one hajj to Mecca. The Medina of Kairouan, the skyline of which includes cupolas and minarets of numerous mosques and zawiyas (religious schools), preserves a network of narrow, winding streets and courtyard houses, and is contained within walls and gates. The souks (market places) in the Medina quarter, has for sale carpets, vases, and leather goods. Merchants rely on tourists for much of their income. The Zawiya of Sīdī Sahab, which contains the tomb of Abu Djama one of the companions of Muhammad, is located next to the Great Mosque. An Aghlabid reservoir, an open circular pool 420 feet (128 meters) in diameter, which dates from the ninth century. Kairouan dazzled the world 1,200 years ago with wealth comparable to that of Basra and Kufa, and as a center of Islamic thought and secular science. A little under 1000 years ago, a split within Islam led to the destruction of that once glorious city. Declared a World Heritage Site in 1988, tourism, the establishment of another university there in 2004, plus the establishment of light industry, has helped revive the city's economy. While Tunisia struggles to reach even higher growth levels to create sufficient employment for an already large number of unemployed as well as the growing population of university graduates, Kairouan's old buildings continue to attract a steady flow of international visitors each year, which is a goldmine for the city's economy. Sacred Destinations. The Great Mosque of Kairouan Retrieved August 5, 2009. UNESCO World Heritage Centre. Kairouan Retrieved December 8, 2008. This page was last modified on 10 April 2018, at 13:53.